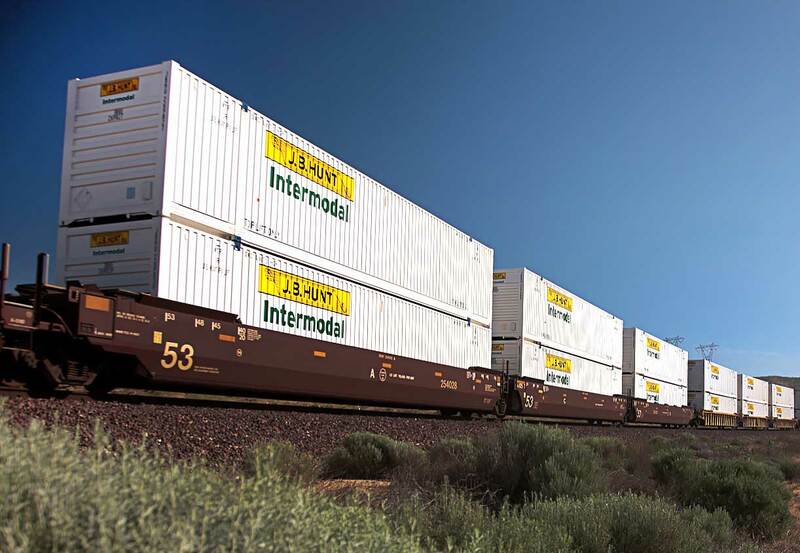 J.B. Hunt Intermodal operates the largest fleet of company-owned 53' containers and drayage fleets in North America. J.B. Hunt has long-standing relationships with major rail providers, including BNSF, Norfolk Southern, CSX, CN, and KCS/KCSM to ensure capacity. Intermodal customers have access to a variety of transporting options, including temperature controlled, international, expedited, and transloading. J.B. Hunt operates the largest fleet of company-owned 53’ containers and one of the largest drayage fleets in the world. Learn more about intermodal services available from J.B. Hunt, including expedited and premium service levels and transloading programs. Learn more about the technology that supports J.B. Hunt’s intermodal operations. J.B. Hunt’s intermodal services deliver value to our customers with higher priority levels and exclusive benefits. J.B. Hunt's network of rail carriers and truckload service providers allows custom levels of service across the United States, Canada, and Mexico. Click on a city below to view intermodal routes, or call an intermodal representative to find the best route and service for your loads. J.B. Hunt's company-owned and contracted drayage network executes door-to-door intermodal service. J.B. Hunt's double-stack containers operate to improve service levels while lowering environmental impact and transportation costs.